An original and surprising form of hotel furniture. The combination of modern form with interesting materials. Simply the OULU ™ line, a new collection of hotel furniture from ATEPAA®. A modern and surpri­sing form are just a few of the many streng­ths of the new OULU ™ line. 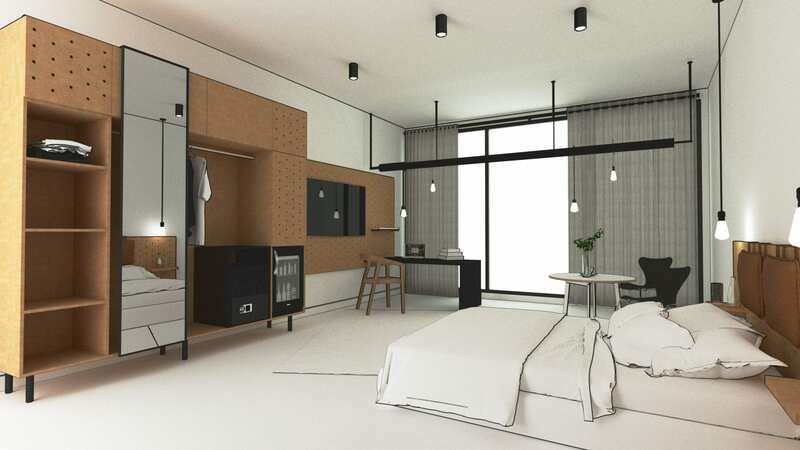 We have created hotel furni­tu­re that will be used in large hotel chains as well as small and creative boutique hotels or even as furni­tu­re for a designer hostel. The OULU ™ line consists of many elements that certa­in­ly enable creative and indivi­du­al adapta­tion to each project. The main element used for the produc­tion is natural birch plywood giving an unusual and very durable construc­tion. For those looking for more standard finishes, we have also prepared several colour options for standard lamina­ted boards. The collec­tion consists of basic elements such as a wardrobe, a place to work or a place for a safe and a travel bag. In addition, the entire line has been comple­men­ted with stylish furni­tu­re around the bed: a headbo­ard and bedside tables. Download catalog showing the entire collec­tion as well as the option for perso­na­li­za­tion. Colors, choice of paint and struc­tu­re, there are many elements that affect the fact that the OULU™ line defini­te­ly stands out on the market. ATEPAA® is a producer that gives large possi­bi­li­ties to adapt produc­tion to expec­ta­tions. Contact us, we will happy to help you out with the project. We create solutions adapted to the interior, keeping in mind the existing or planned arran­ge­ment. Our design depart­ment adjusts the availa­ble shapes, often comple­men­ting them with creative and indivi­du­al elements, thus giving the rooms a unique charac­ter.